Updated: 8 April 2019 Last year Questions? Click here. I list these events as the information becomes available. For further information about an event that is listed, click on the pink event name if it is underlined or call the "Info" number if given. 42nd Annual Three Kings Day Parade in El Barrio. Live camels, colorful puppets, parrandas, music and dancing on this magical day. The parade route begins at 106th Street and Lexington Avenue and ends at 115th Street and Park Avenue. After the parade, go to the El Museo for some live music and free admission to Las Galerías. [Contact Museo del Barrio]. Three Kings Day in the Bronx. Public School #5, 564 Jackson Avenue at 149th Street, Auditorium. Free entrance. The first 500 children ages 1-9 will receive a toy. Info: Leila Martínez, 1-718-991-3161. Three Kings Day in Waterbury CT. Celebrating the visit of the Three Kings to the Baldwin Rec Center, 135 E Liberty St, Waterbury, CT 06706. Live music, food. Children ages 1-9 will receive a toy and a book bags from the 3 Kings. Info: David Cueto dominicanfest@gmail.com. Three Kings Day Parade in Brooklyn. Broadway and Graham Avenue, Williamsburg. Dominican Independence Day Celebration. By the Office of the Brooklyn Borough President, City Council members Rafael Espinal and Antonio Reynoso, and the Consulate General of the Dominican Republic in New York. Brooklyn Borough Hall, 209 Joralemon Street, Brooklyn NY 11201 [MAP]. RSVP: 1-718-802-3700 or Click Here. Thursday February 16, 10:00am-1:00pm, Bronx NY. Roberto Clemente School P.S.19, 325 South 3rd Street, Brooklyn NY. Entertainment, live music, refreshments, with a tribute to Dominican art and cinema. 172nd Anniversary of the Independence of the Dominican Republic. And Dominican Mayor for a Day Celebration. Presented by the Dominican Committee of Waterbury, at Waterbury City Hall, 235 Grand St Waterbury CT 06702. Love Is All Around. Valentine's Day at the Bronx Museum of the Arts, 1040 Grand Concourse, Bronx, New York 10456, 1-718-681-6000. An afternoon of art activities for the entire family. CLICK HERE to register and for more information. Dominican Independence Celebration Come celebrate the independence of the Dominican Republic! 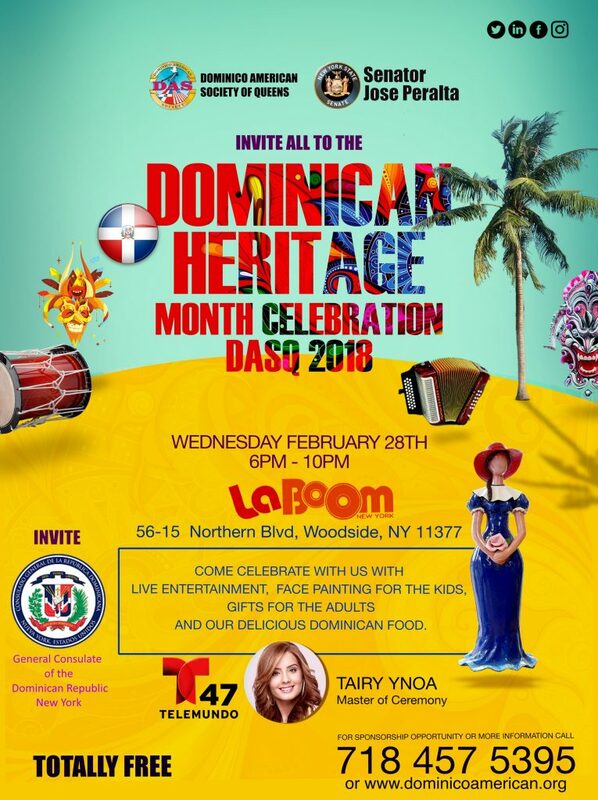 Presented by the Dominican-American Society of Queens and Julissa Ferreras of District Council 21. PS19 at 98-02 Roosevelt Avenue, Corona, Queens NY 11368. We'll have live music, Dominican food, presents and surprises. Call 1-718-457-5395 for more information. Dominican Flag Raising 2015. City Hall, 235 Grand St Waterbury, CT 06702. For the celebration of Dominican Independence. Organized by the Dominican Committee of Waterbury. Info: David Cueto dominicanfest@gmail.com. At Peace with our Temperament. American Family Community Services Inc, 76-05 Roosevelt Ave., Jackson Heights NY 11372. Tel: 1-718-639-8370. Web: www.americanfamilyny.org/. Reserve your space today. Commemoration of the 171st anniversary of the Independence of the Dominican Republic. City Hall, 255 Main St. White Plains NY 10601. Followed by coctails to celebrate at the restaurant Blue Amber, 49 Mamaroneck Ave., White Plains, NY 10601. Tel 1-914-358-9291. Sponsored by UNIDOM Inc, Unidad Dominicana de Hudson Valley. Latin Jazz Festival 92nd Street Y, tickets required. To be announced: Normally there aren't many hispanic parades or festivals in March or April. April 5-16 2019. Havana Film Festival New York, at different venues in New York City (see schedule). Opening night: April 9th located at the SVA Theater: 333 West 23rd Street, NYC from 7:00pm to 10:00pm. The film being screened is El Viaje Extraordinario de Celeste García / The Extraordinary Journey of Celeste Garcia. Early Bird tickets are $20.00 + $2.85 fee, and the Screening + After Party tickets are being sold for $75.00 + $6.20 fee; CLICK HERE for details. Email: hffnyinfo@gmail.com. Phone: 1-212-946-1839. Many events have not been announced yet. Sunday May 19th, 2019, Manhattan NY, 1:00pm-3:00pm, rain or shine. 13th Annual New York Dance Parade. Theme: MOVEMENT OF THE PEOPLE. From 21st and Broadway to Saint Marks Place, then on Saint Marks Place to Tompkins Square Park for a dance fest 3:00pm-7:00pm (details). More information: [FAQ]. Info: 1-267-350-9213 [more contact info]. Sunday May 19th, 2019, 2:00-5:00pm, Bergenline NJ: Cuban Parade and Festival of New Jersey. Begins at 79th Street and Bergenline Avenue in North Bergen NJ (entrance to James Braddock Park) and concludes at 43rd Street and Bergenline Avenue in Union City, NJ, with a reviewing stand ceremony. Western Massachusetts Hispanic Family Festival. Festival May 30 - June 2, Springdale Park, 844 Main Street, Holyoke Massachusetts. Info: www.lafamiliahispana.org; Telephone: 1-413-532-4496. 152nd Street Cultural Festival. South Bronx, 152nd Street between Jackson and Union Avenues. Live musical performances, dancing, comedy, celebrity appearances, children's pavilion, food and vendor kiosks. Contact: National Puerto Rican Day Parade Inc, email NPRDP.Parade@gmail.com. See website for vendor information. 2018 Loisaida Festival. Avenue C, Lower East Side. Sunset Park Cinco de Mayo Celebration. Sunset Park Recreation Center, 43rd Street at 7th Avenue in Brooklyn. "Join NYC Parks for a celebration of Mexican culture in the community with music, dance, crafts, and more! Movies Under the Stars: CHAVELA... After the celebration, come to the lawn at Fifth Avenue for a Friday screening of CHAVELA, presented by Mexico Now!" Phone: 1-718-972-0567; email: jostin.rodriguez@parks.nyc.gov. 13th Annual Bronx Cinco de Mayo Celebration. Crescent Avenue between 187th Street and Belmont Avenue [MAP] [CONTACT]. Cinco de Mayo Parade. Asociación Tepayac. Central Park West from 106th Street to 97th Street. Festival de Verano 2018 (Summer Festival) Plaza "Las Américas", 175th Street between Broadway and Wadsworth Avenue. For the whole family: Games, Dance, Karaoke, DJs, Live Music, and More. Contact: 1-646-314-3845. 11th Annual May Day March for Worker and Immigration Rights. From Union Square Park at 14th Street and Broadway. Cinco de Mayo Festival. Schoolyard on East 109th Street between 2nd and 3rd Avenues. East Harlem Block Nursery Celebration. 215 East 106th Street, between 2nd and 3rd Avenues. Celebrating 50 years providing service to the East Harlem community. Old-school block party, Salsa and freestyle music, free food and games for children and families. Info: www.eastharlemblocknursery.org, 1-212-722-6350, 1-917-885-0898. St. Nicholas Avenue Festival. Washington Heights, Saint Nicholas Avenue, 181st Street to 188th Street. Dominican vendors, food, and music; rides for children. Sundays Memorial Day through Labor Day 2019, Orchard Beach, Bronx NY. Salsa Sundays at Orchard Beach. Usually every Sunday 1:00pm-6:00pm from Memorial Day through Labor Day weekend. Details for 2019 to be announced; watch this site for updates. Sunday June 2, 2019, 12:30–2:30pm, Yonkers NY. Yonkers Hispanic Day Parade down South Broadway. Yonkers Hispanic Cultural Foundation, Inc. [Facebook] Email: yonkershcf@gmail.com Phone: 1-914-222-5101. Western Massachusetts Puerto Rican Parade. Starts at 11:00am at Main and Dwight Streets and goes down Main Street to Springdale Park, 844 Main Street, Hispanic Family Festival in Springdale Park May 30 - June 2. Info: www.lafamiliahispana.org, Telephone: 1-413-532-4496. 34th annual 116th Street Festival, the biggest Latin Festival in the Northeast. Live music, fun, art, food. Featured artists to be announced. Contact: 1-212-348-8270. Sunday June 9, 2019, Manhattan NY, 11:00am-5:00pm. 61st Annual National Puerto Rican Day Parade. Contact: [Email: NPRDP.Parade@gmail.com] [Contact form] [Facebook]. 37th annual Coney Island Mermaid Parade. Coney Island: 21st Street and Surf Avenue to West 10th Street to Boardwalk to Steeplechase Plaza [MAP]. Greater Hartford Latino Fest. Church of the Good Shepherd - Parish House, 155 Wyllys Street, Downtown Hartford, Connecticut. Phone: 1-860-983-5629. Email: hartfordlatinofest@gmail.com. Puerto Rican State Parade and Festival. Graham Avenue between Metropolitan Avenue and Devoe Street. 40th Annual Hispanic Week Festival. Greater Hartford Puerto Rican Day Parade and Festival del Coquí. Bushnell Park, Jewell Street [MAP] [Facebook] [Website] Email: CICDPRParade@gmail.com. Bronx Puerto Rican Parade Festival. Poe Park from Grand Concourse 192-194 Street. Cuban Parade New Jersey. Starts at noon from Bergenline Avenue from 79th Street in North Bergen to 43rd Street in Union City. Info: 1-201-240-6145; info@desfilecubano.com. Puerto Rican Festival of Perth Amboy. Rudyk Park. Info: 1-848-250-8575, 1-732-925-0488. Sunday June 11th, 5:00pm, Sunset Park, Brooklyn NY. 3rd Annual Puerto Rican Parade and Festival of Sunset Park. When: Parade 5:00pm, Festival 6:30pm. Where: Sunset Park, Brooklyn: Parade from 59th Street to 44th Street along 5th Avenue. Festival in Sunset Park (entrances at 44th Street and 5th Avenue, 43rd Street and 5th Avenue, and 44th Street and 6th Avenue). The procession will be led by a group of musicians playing the traditional Puerto Rican sounds of Bomba y Plena. The musicians will be accompanied by folk dancers and Vejigantes, or folk figures representing the spiritual side of Puerto Rican culture, which are often found at celebrations in Puerto Rican communities. Parade participants include Puerto Rican musicians, dancers, and other artists who will showcase the many traditional and contemporary expressions of Puerto Rican Culture. Community groups serving Sunset Park will also be on hand to help celebrate. Capping off the evening will be a festival in Sunset Park itself. The multifaceted Latin big band Cita Rodriguez y Borinquen Orchestra will get spectators moving to Latin beats from many genres. The festival is for all ages and organizers expect to see children, grandparents, and everyone in between celebrating in the park. The festival is free and open to the public. Elizabeth Colombian Day Parade. Parade begin at 50 Winfield Scott Plaza (in front of City Hall) turn right onto Elizabeth Avenue, then right onto Broad Street ending on Morris Avenue. The Colombian festival will not be held in 2016; it is hoped it will come back in 2017. Sunset Park Puerto Rican Parade. 5th Avenue and 59th Street in Sunset Park. Live music, arts, and the Afro-Puerto Rican traditions of Bomba y Plena as well as the participation of artists, local businesses and community organizations in Sunset Park. Facebook. Facebook. Telephone: 1-917-995-6558, 1-347-709-0731. Email: ElGritoDeSunsetPark@gmail.com. Hispanic Week Parade. Time and route not yet published. Info: Carmen Zorrilla, 1-978-7433. San Juan Bautista Celebration. Join the Puerto Rican Committee of Elizabeth as they celebrate San Juan Bautista (John the Baptist), the patron Saint of the Island. The event will take place at O'Donnell Dempsey Center located at 618 Salem Avenue. 2nd Annual Family Fitness Festival . Williamsbridge Oval Park, Bainbridge Avenue at 208th Street. Boot camp demonstrations, relay races, healthy cooking demonstrations, exercise tips, screenings, face painting, gifts, prizes, giveaways. Info: 1-718-881-8999. Salsa Sundays at Orchard Beach. Every Sunday 1:00pm-6:00pm from Memorial Day through Labor Day weekend. 111th Street Salsa Street Party and Old-Timers Stickball Game. West 111th Street between 5th and 6th (Lenox / Malcolm X) Avenues. Contact: Santos Negron negron_santos@yahoo.com. Latin Culture Carnival Bronx Edition. INFORMATION FROM LAST YEAR: Southern Boulevard from 163rd Street to Westchester Avenue. This event is fun for the whole family and a great place to promote your company's products o services so be sure to take advantage of our early promotions and arrange for your business to take part in some of the most important open-air events in the Bronx! CONTACT: Email info@carnavalculturalatina.com ... Phone: José Tejada, 1-917-776-5951. 30th Annual Bronx Dominican Parade Grand Councourse between 181st and 167th Streets. Junta Hispana. Location: Flushing Meadows Corona Park – near the Unisphere Admission: Free. RAIN or SHINE We'll be there. Stage performances begin at 12 noon. At the intersection of Memorial Drive and Market Street in front of the Peruvian Consulate in Paterson, New Jersey on Saturday, July 29, 2018 at 12 noon. Festival Popular Duartiano (Juan Pablo Duarte Festival). Clay Avenue between Claremont Parkway East and East 173rd Street. Colombian Independence Parade of New York (Colombian Day Parade), Northern Boulevard, 69th-86th Streets. Sunday July 15, 2017, 12:00 noon - 7:00pm, Valhalla NY. At Kensico Dam, 1 Bronx River Parkway, Valhalla, NY 10603. Rain or shine. Seating is informal; bring blankets or folding chairs for seating on the lawn. Festival de las Flores (Festival and Parade of the Flowers). Northern Boulevard from 69th to 88th Strees in Jackson Heights, Queens. Sunday July 8th: Live music, Noon-2:00pm. Sunday July 9th: Parade of the Flowers, Colombian silleteros with their creations. The parade will consist of three floats, numerous cars and dancers. There will be 33 flower ornaments, each arranged by a company or an organization with its logo on it. [MORE INFO]. Puerto Rican Family Cultural Parade and Festival. VI Colombian Independence Day Festival, Eisenhower Park, 1899 Hempstead Turnpike, near the LIRR Westbury station. Featuring: Guayacán Orquesta, John Onofre, El Clan, Alek, Pulido Son, Folclor. Food, arts and crafts, DJs, raffles [CONTACT]. Mustard Seed Children Supplies Drive. Fort George Presbyterian Church, 1525 St. Nicholas Avenue at 168th Street, New York NY 10033. In support of Hogar Immanual in the Dominican Republic, a home for orphaned children with cognitive and psychomotor disabilities since 2001. Bring household and baby supplies (SEE LIST), get free lunch! All donations are tax-deductible. For more information call Yury Rodríguez at 1-973-390-3528, Rosmary Morel at 1-917-532-6734, or Hanette Gómez at 1-917-577-7867. Email: hogar.immanuel@mustardseed.com. Website: www.mustardseed.com. More about Mustard Seed: See flyer. Saturday, July 23, 2016, 2:00pm-8:00pm. 8th Rumba Festival of New England with Ismael Miranda, Yolanda Rivera, and Edwin Bonilla. Free to the Public. 155 Wyllys Street, Hartford, CT. For more info call 1-860-371-8098. CANCELED. Elizabeth Colombian Festival celebrating the traditions and culture of the Colombian community. 11 West Grand Street. Live music and dance, arts and craft vendors, Colombian food, children's activities. ¡Presente! The Young Lords in New York at The Bronx Museum of the Arts, 1040 Grand Concourse at East 165th Street. IND Subways B and D, 167th Street stop; IRT #4, 161st Street stop. Admission: Free. Hours: Fridays 11:00am-8:00pm; Saturdays and Sundays: 11:00am-6:00pm. Email: info@bronxmuseum.org, Phone: 1-718-681-6000. Bronx Summer Concert Series. Orchard Beach every Sunday, July 12 to August 30, 1:00pm-5:00pm, main stage, Section 9. Domingo Quiñones, D'son-4, Conjunto Imagen, Karl Browne Band, Julián Vázquesz "El Diamante de la Salsa", Music with a Message, Típica 73, Nelson González, Mambo Legends Orchestra, CharanSalsa, Luís Damón. Zumba and health screenings too. Every Sunday from Memorial Day to Labor Day, Bronx NY. Salsa Sundays en Orchard Beach. Todos los domingo 1:00pm-6:00pm desde Memorial Day hasta Labor Day. Carnaval del Barrio (Carnaval Aguadillano) 2019. East 116th Street between 2nd and Lexington Avenues. Salsa orchestras, rides for children, food stands, crafts, other vendors. Performers Info: Héctor 1-347-645-5656. Vendors info: Edwin Marcial 1-347-596-1308. Once again bringing the best of latin orchestras, merengue and bachata. Brooklyn 24th Street Summer Cultural Festival its and outdoor free event, with ethnic food vendors, general merchandise vendors and the well known CARDONA DOMINO TOURNAMENT. Vintage cars, also children amusements. Location: 24th Street between 4th and 5th Avenues. Brooklyn NY 11232. Subway: Take the R train to 24th Street stop. Vendors and Performers: please contact Héctor 1-347-645-5656. 18th Dominican Parade and Festival of Brooklyn. From Graham Avenue and Metropolitan Avenue to Graham Avenue and Broadway. Festival at Graham and Broadway after the parade. This year's event is dedicated to Joseito Mateo, "King of Merengue". For more information, call 1-646-717-0603 or email brooklyndominicanparade15@gmail.com. Sundays May 28th through September 2, 2018, Orchard Beach, Bronx NY. Carnaval del Barrio (Carnaval Aguadillano) 2017. East 116th Street between 2nd and Lexington Avenues. Live Latin music entertainment from noon to 10:00pm. Performers and Vendors Info: Hector 1-347-645-5656. XII Salvadoran-American Day Festival of New York. Hempstead, Long Island, NY 11550. Peruvians for Progress Parade. Celebrating 197 years of Peruvian Independence. Parade starts at 11:00am at Union Square. Contact: 1-908-485-6746 or 1-908-906-1019; email: Info@peruviansforprogress.org; Internet: peruviansforprogress.org. Festival de la Calle 6 (6th Street Festival): Lower East Side: East 6th Street between Avenue D and the FDR Drive. Live Latin music, vendors. Performers and vendors info: Hector 1-347-645-5656. Ecuadorian Parade Northern Boulevard, 69th Street to 86th Street. Info: 1-516-410-0985, 1-917-225-4509, 1-718-740-1607. Email: oswaldoguzman@yahoo.com. 25th Perth Amboy Dominican Festival. At La Playita (the beach). 15th Puerto Rican and Hispanic Day Parade of Western New York. Parade starts at Buffalo City Hall and marches north on Niagara Street (Avenida San Juan), to be followed by a festival with food and live music and entertainment in LaSalle Park on the Buffalo waterfront. Info: 1-716-310-8644; prparadeofwny@gmail.com. 17th Dominican Parade and Festival of Brooklyn. From Graham Avenue and Metropolitan Avenue to Graham Avenue and Broadway. Festival at Graham and Broadway after the parade. For more information, call 1-646-717-0603 or email brooklyndominicanparade15@gmail.com. Latin Parade and Festival of Haverstraw. From Emeline Park in front of the Post Office to Haverstraw Middle School. Live music: Messiah, Urbanda, Star Team Band, Raulín Rosendo, Orlando Rodríguez, Sonsublime, Warachando, LD Legendary, Exibición de Carros, Guara Customs, Star Family. Info: 1-845-429-7764. Ecuadorian Parade. Bergenline Avenue from 59th in East New York Street to 43rd Street in Union City. Ecuadorian Festival. After the parade. Schuetzen Park at 3167 John F. Kennedy Blvd. Dominican Day Parade of Philadelphia. Starts at 8th and Lehigh, left on Lehigh to Front Street to Light House Field on Front and Erie Avenue. 16th Dominican Parade and Festival of Brooklyn From Graham Avenue and Metropolitan Avenue to Graham Avenue and Broadway. At the end of the parade is the festival in the Grand Street School Campus on Bushwick Avenue between Stagg and Maujer Streets, 2:00-7:00pm. For more information, contact the Parade President, Estella Jiménez at 646-717-0603 or brooklyndominicanparade15@gmail.com. 3º Festival Dominicano de Connecticut. Downtown Hartford, 155 Wyllys Street, Church of the Good Shepard. Live music, dance, food, sports, education. Free parking. Info: 1-570-861-6157, 1-203-982-5008; email: dominicanfest@gmail.com. Ecuadorian Parade Northern Boulevard, 69th Street to 86th Street. Contact: communityboard3@nyc.rr.com. 24th Street Summer Festival of Brooklyn. 24th Street between 4th and 5th Avenues. Live Latin Music, entertainment, ethnic food, general merchandise vendors. Performers and vendors info: Hector 1-347-645-5656 [SEE POSTER]. Puerto Rican Parade and Festival Lincoln Park to Exchange Place. 15th Dominican Parade and Festival of Brooklyn The parade begins on Graham Avenue and Debevoise Street. At the end of the parade is the festival on Bushwick Avenue and Stagg Street at 1:00 PM. It is behind the school, Progress Inc., High School. For more information, contact the President, Estella Jiménez at 646-717-0603 or brooklyndominicanparade15@gmail.com. Latin Culture Carnival Queens Edition: INFORMATION FROM LAST YEAR: Junction Boulevard from 37th Avenue to Roosevelt Avenue. This event is fun for the whole family and a great place to promote your company's products o services so be sure to take advantage of our early promotions and arrange for your business to take part at one of the most important open-air events in the Queens. CONTACT: Email info@carnavalculturalatina.com ... Phone: José Tejada, 1-917-776-5951. Brooklyn Puerto Rican Parade & Festival. Graham Avenue and Broadway. Live Bands, dancers, food vendors. Performers and vendors information: Hector 1-347-645-5656. Queens Hispanic Parade: 37th Avenue from 69th to 86th Street. Contact: desfilehispanodequeens@gmail.com. Mexican Day Parade. Celebrating Mexican Independence, the Cry of Dolores, September 16, 1810. Madison Avenue between 38th and 27th Street [NYC DOT street closings - this page lasts for only one week]. 21st Annual Central American Independence Day Celebration. Parade and Festival celebrating the 197th anniversary of Central America's independence from Spain on September 15th, 1821: Guatemala, El Salvador, Honduras, Nicaragua, and Costa Rica. INFORMATION FROM LAST YEAR: The Parade forms at 10:00am on Southern Boulevard between 178th and 179th Streets and the procession starts at noon on East Tremont Avenue at the Happy Land Monument, goes southeast on Tremont to Boston Road, turns right and goes southwest to Charlotte Street and Crotona Park East. The Central American Independence Day Festival follows the parade in Crotona Park between Crotona Avenue and Claremont Parkway with stage performances, food and drink vendors, arts and crafts, information booths, and entertainment for the whole family. [MAP] Telephone: 1-347-547-9189. Brazilian Day in New York 2018: Little Brazil - 46th Street and 6th Avenue. Contact: info@brazilianday.com; Tel: 1-212-382-1631 x3500. Sunday September 2, 2018, Bronx NY. Salsa Sunday at Orchard Beach. Last Salsa Sunday for 2018. Williamsbridge Oval Park 80th Anniversary Celebration: Bainbridge Avenue and East 208th Street (enter through the tunnel), at the Recreation Center [MAP]. This park serves a diverse community of Dominicans, Puerto Ricans, Bangladeshis, Mexicans, West Indians, Albanians, West Africans, and many other groups. It was built between 1934 and 1937 by the Works Progress Administration (WPA) of President Franklin D. Roosevelt's New Deal. The celebration will feature 1930s music, 1930s dance and street games, arts and crafts, a history presentation, and appearances by a number of politicians and NYC Parks Department officials; SEE FLYER. Read more about Oval Park HERE and see a photo gallery HERE. Saturday September 9, 2017, 12:00 noon - 7:00pm, Bronx NY. Longwood Festival. Intervale Avenue between Longwood and Dawson Avenues. Featuring Tito Rojas “El Gallo de la Salsa” and Nayibe la Gitana. Info: 1-718-450-3320, FreddyPerezJr@aol.com. Puerto Rican Social and Cultural Festival of New Britain. On High Street between Broad Street and Lafayette Street. Live entertainment, music for the whole family, food and beverages, arts and crafts. For more information or if you are a vendor please contact Isabel Rosa at 1-860-680-8075. Email: prfestivalofnb@comcast.net. International Children's Parade and Festival. In Williamsburg: Along the Avenue of Puerto Rico (a.k.a. Graham Avenue) from Metropolitan Avenue to Broadway. Info: 1-718-802-3700. 5th Annual Viva La Comida Festival. Along 82nd Street, between Roosevelt and Baxter Avenues, Jackson Heights, NY 11372. Food and live music. Artists include LA Cumbiamba eNeye, Trio Yuka Seca, Os Clavelitos, La Huerta, Yailin. Info: www.vivalacomida.com/, info@82ndstreet.org, 1-718-335-9421. Puerto Rican Parade and Festival of Brooklyn. Graham Ave and Broadway. Live Salsa Bands, food, craft vendors. Performers & Vendors info: Hector, 347-645-5656. Dominican Festival of Waterbury. Library Park, 267 Grand Street, Waterbury CT 06702. Live Bands, dancers, food vendors. Info: 1-570-861-6157, 1-203-982-5008, dominicanfest@gmail.com, Facebook. Mexican Day Parade. Madison Avenue from 38th to 27th Street (information from NYC DOT street closing schedule). Latin Culture Carnival: Junction Boulevard between Roosevelt and 37th Avenues. Fun for the whole family and a great place to promote your products or services. Contact us to take advantage of our first promotions so your company can take part in one of the most important open-air events in Queens and in all of New York City. Telephone: 1-917-776-5951; Email: info@carnavalculturalatina.com. ¡WEPA! Festival. In Williamsburg: Havemeyer Street between S 4th Street and Grand Street. Southside Connex – Celebrating the People and Culture of the Southside – is an annual street festival organized by El Puente's Green Light District, featuring local artists Bomba Yo, Formula 4 Merengue Típico, Conjunto Sabor, Dreams In Motion, The New York Mariachi Conservatory, Karen J. Pangantihon, Shy Richardson. Queens Hispanic Parade: 37th Avenue between 69th and 86th Streets, Jackson Heights. Contact: 1-917-971-6919. 40th Hispanic State Parade of New Jersey. 43rd Street between Bergenline and Kennedy Blvd. Some events have not been announced yet. 23rd annual Panamanian Day Parade. INFORMATION FROM LAST YEAR: In Crown Heights along Franklin Avenue (Panama Avenue) from Bergen Street to President Street, and then along President Street to Classon Avenue, ending in a street fair at Eastern Parkway. All participants are asked to assemble at 9:00am at Franklin Avenue and Bergen Street. Parade Ceremony: 10:00am. Parade starts: 11:00am. With Willie Panama and his Orchestra. Panamanian Street Fair at the end of the parade. [2018 honorees] [POSTER] Info: 1-347-863-8086, 718-604-1912. 34th Annual Bronx Halloween Parade. Starts on Simpson Street and Westchester Avenue. More details to come. XXI Virgin Mary Parade in honor of the Virgin Mary in her different aspects. Amsterdam Avenue from 86th Street to 107th Street. 54th Annual Hispanic Day Parade. Fifth Avenue from 44th Street to 64th Street [Contact]. North Bergen NJ, Sunday October 7, 2018, 11:00am-4:00pm. Info: Michael-Iris@BerkeleyCollege.edu. Sunday, October 7, 2018, 12:00 noon - 2:00pm. Dominican Parade. 37th Avenue - 69th Street to 86th Street [details]. Contact: communityboard3@nyc.rr.com. Sunday, October 21, 2018, 12:00 noon - 2:00pm. Bolivian Parade. 37th Avenue - 69th Street to 86th Street [details]. Contact: communityboard3@nyc.rr.com. Mustard Seed Communities ... Caring for the Most Vulnerable. Gala anniversary fund-raising dinner for Hogar Immanual in the Dominican Republic at Congrejo (near Puerto Plata): a home for orphaned children with cognitive and psychomotor disabilities since 2001. With special guest Milly Quezada, The Queen of Merengue. Where: Marina del Rey, 1 Marina Drive, Throgs Neck, Bronx NY 10465 [MAP]. Admission: $150.00. Telephone: Yury Rodríguez at 1-973-390-3528, Rosmary Morel at 1-917-532-6734, Grecy Martínez at 1-929-382-1503, or Adelfi Molina at 1-201-280-8459. Email: hogar.immanuel@mustardseed.com. To read more about Mustard Seed Communities, CLICK HERE. Queens Dominican Parade. Jackson Heights, 37th Avenue from 70th Street to 86th Street. 10th annual Hispanic/Latin Book Fair. Renaissance Charter School, 35-59 81st Street, Jackson Heights, Queens 11372. Friday: 7pm-10pm; Saturday: 11am-7pm; Sunday: 11am-7pm. Facebook: www.facebook.com/HLCCNY/. Email: info@hlccny.org, hlccnybookfair@gmail.com. 21st Annual Panamanian Pre-Independence Day Parade and Street Fair. Crown Heights, Bergen Street and Franklyn Avenue. Ends in a street fair on Classon Avenue between President Street and Eastern Parkway. Street. Grand Marshals: Juana Smith, Willie Panama, Gloria Karamanthes. Info: 1-347-863-98086, 1-718-605-1912, 1-718-444-0448. Jacob Javits Center, North Pavilion 608 West 40th Street, 9:30am-5:00pm each day. Two days of FREE activities including musical performances. Saturday: Calpulli Mexican Dance Company, Piel Canela Dancers, Frankie Negrón, Galilea Mintijo, Ursula Carranza, Salsa Congres, Francisca Lachapel, Clarissa Molina, Adamari López, Dascha Polanco, Iris Chacón, Christina Méndez, Danilo Carrera. Sunday: DJ Lobo, Cali pal' mundo, Maite Perroni, Karol G, Messiah, El Artista, Snow Tha Product, Reykon y Karol G, Kevin Alejandro, Selenis Leyva, Andrea Navedo, Reykon, Daddy Yankee. Info: festival@peoplemag.com. Queens Bolivian Parade. Jackson Heights, 37th Avenue from 69th Street to 86th Street. Intervale Avenue and Dawson Street (at the north end of Rainey Park in Longwood) en el Condado de la Salsa! Food, games, live entertainment: Toby Rivera, Angelo y su Conjunto Modelo. Info: Leila Martínez, 1-718-991-3161. 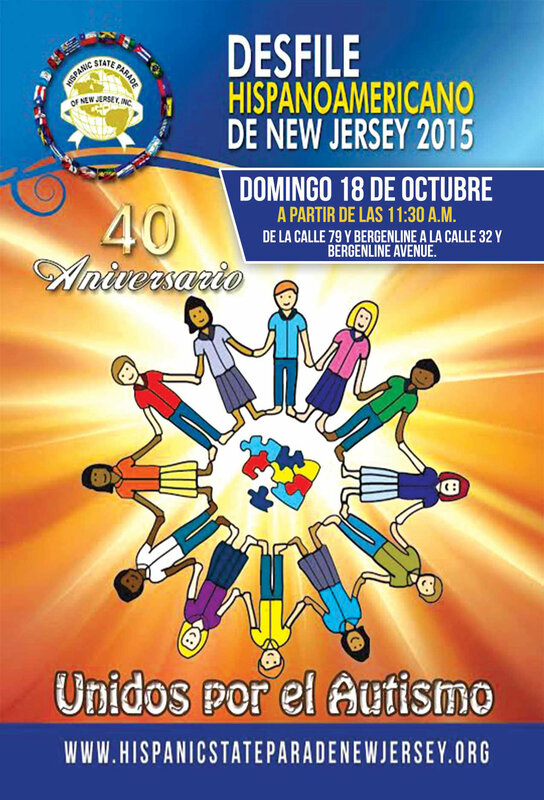 2015/10/04... NJ State Hispanic Parade in Union NJ RESCHEDULED for October 18 (see below). Concilio Puerto Rican Festival Parade. 16th Street and Benjamin Franklin Parkway. Concilio's Annual Puerto Rican Day Parade is the “Crown Jewel” of the Puerto Rican Festival every year. Youth groups, community organizations, local and regional schools, corporate sponsors, popular artists and many others across the tri-state region participate in making this parade a true showcase of Puerto Rican and Latino Culture. 20th Annual Panamanian Independence Day Parade. Parade starts at Bergen Street and Franklin Avenue; ends in a street fair at Classen Avenue between Eastern Parkway and President Street. Info: 1-718-605-1912; 1-347-885-3092; 1-917-402-5106. Along Bergenline Avenue from 80th Street in North Bergen to 32nd Street in Union City [Poster]. Normally there aren't any Hispanic festivals or parades in November or December. That's all I have for 2019 so far! Disclaimer: I don't organize these events; I don't have anything to do with them. I only collect the information here for your convenience from newspapers and other publicly available sources. Everything I know is already on this page. However, if you would like to report an error, or to submit an event that is not already listed, feel free send me an email.